New moms have all been there: Crying infants and sleep deprivation. Managing the needs of older siblings. Keeping social contacts going. Relying on family to help out. Those familiar problems are shared by Orca* whale mothers, and as it turns out, the lives of Orcas turn out to parallel ours several surprising ways. 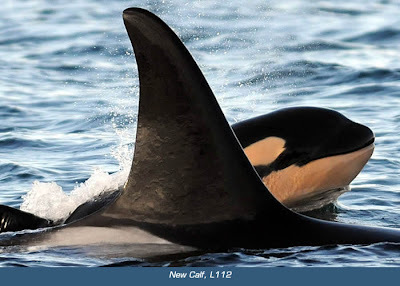 Decades of research by Dr. Kenneth Balcomb at the Center for Whale Research (CWR) and others has unlocked some of the mystery of how the Orcas live, and the Center has been following the same individual whales for over thirty years. We thought it would be fun to kick off this blog by bringing you information on the mothers and their calves, in honor of Mother's Day, since three new babies were born this winter, and at least two of them were re- sighted earlier this week after a prolonged absence. This is exciting news, since mortality is high -- as many as 40% of the calves don't survive the first year of life. Although scientists don't entirely know why the death rate is so high for baby whales, we do know that the environment into which they are born can be harsh. Humans swaddle our babies in blankets and crank up the thermostats to keep them warm - Orca babies on the other hand go from a cozy 97.5 degree environment to 45 - 55 degree water in seconds, temperatures that adult humans can survive for about two to four hours. A calf born in captivity will swim continuously, and scientists speculate that this is because the babies have thinner blubber and therefore need to generate body heat by moving in order to keep warm. They are also less buoyant and need to surface to breathe more often than their mothers. The CWR confirms that our local Orcas are rarely motionless, even during rest periods. And just as our babies first babble, then begin to shape words and sentences, Orca calves need to learn to communicate with their families. Scientists at Sea World report that Orca calves can vocalize soon following birth, and characterize the sounds the babies make as "loud and high pitched, resembling screams". After about two months the babies begin to make sounds like their moms, and will continue to add to their vocal repertoire as they get older. Research shows that mother dolphins and Orcas in captivity show a significant change in sleep pattern for weeks or months following the birth of their calves, no surprise there when you think about having to keep up with the babies! The wild Orcas may have an edge over their captive counterparts however, in that they have an extended network of family to help out, and the older siblings, aunts, uncles and cousins are all known to babysit and entertain the calves and thereby giving the mother whale a chance to feed and maybe catch a nap. Over the coming weeks we'll follow the new baby Orcas of our local J, K and L pods, and explore the lives of our resident Killer Whales in detail, from the new calves to the old grandmother (thought to be in her late nineties). We'll bring you insight into the individuals, and explain what is known (or what the biologists are currently researching) about the population as a whole, and what problems they may be facing in the future. Heard a presentation from Brent Nixon stating that the extremely high death rate for first born calves is due to environmental toxins. Thereafter, the death rate is reduced. Do you concur?